Every participating team that comes to the Kauai Coffee Estate will receive a free bag of Kauai Coffee. Get ready! Your team is going on a scavenger hunt! Remember to check back at 9:00 Wednesday morning to download the Kauai Coffee Company Scavenger Hunt directions. 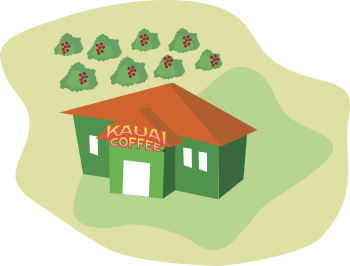 Every team completing the race and reaching the Kauai Coffee farm gets a bag of Kauai Coffee. Note: Please make sure each player registers and signs the liability form before participating, or your team may be disqualified. Minors must be registered by their parent. I understand that during my participation in the Kauai Coffee Company Scavenger Hunt (the “Hunt”) in part on the property occupied by Kauai Coffee Company, LLC (“KCOF”) and in part in other locations on the Island of Kauai, I may be exposed to a variety of hazards and risks, foreseen or unforeseen, which are inherent in the Hunt and cannot be eliminated without destroying the unique character of the Hunt. These inherent risks include, but are not limited to, the dangers of serious personal injury, property damage, and death (collectively, the “Injuries and Damages”) from exposure to the hazards of the Hunt’s activities, and KCOF has not tried to contradict or minimize my understanding of these risks. I know that the Injuries and Damages can occur by natural causes or activities of other persons, animals, Hunt participants, Hunt leaders and assistants or third parties, either as a result of negligence or because of other reasons. I understand that the risks of such Injuries and Damages are involved in outdoor events such as the Hunt and I appreciate that I may have to exercise extra care for my own person and for others around me in the face of such hazards. I further understand and acknowledge that (i) the Hunt will be primarily self-conducted without the presence or assistance of personnel or employees of KCOF and/or of any other entities or individuals involved in the staging and conduct of the Hunt and (ii) on the Hunt there may not be rescue or medical facilities or expertise necessary to deal with the Injuries and Damages to which I may be exposed. Scavenger hunts are completed along public use sidewalks, paths, parks, and buildings. Therefore, participants are expected, as a courtesy and for safety, to yield right of way to vehicle, bike, and pedestrian traffic when and where applicable. KCOF reserves the right to alter, modify, or cancel the Hunt due to local event (i.e., parade, concert, filming, public demonstration), hazardous weather, unsafe conditions, or by request of a public (government) entity. I have read any rules and conditions applicable to the Hunt made available to me, and I acknowledge my participation is at the discretion of the Hunt coordinator. I agree to abide by and adhere at all times to all rules required of participants in the Hunt. The Hunt does not include carpooling, transportation, or transit during, to or from the Hunt, and I am personally responsible for all risks associated with this travel. If I decide to leave early and not to complete the Hunt as planned, I assume all risks inherent in my decision to leave and waive all liability against KCOF arising from that decision. Likewise, if the leader of the Hunt has concluded the Hunt, and I decide to continue without the leader, I assume all risks inherent in my decision to continue and waive all liability of any and every kind against KCOF arising from that decision. This Liability and Photo Release is intended to be as broad and inclusive as is permitted by law. If any provision or any part of any provision of this Liability and Photo Release is held to be invalid or legally unenforceable for any reason, the remainder of this Liability and Photo Release shall not be affected thereby and shall remain valid and fully enforceable. To the fullest extent allowed by law, I agree to WAIVE, DISCHARGE CLAIMS, AND RELEASE FROM LIABILITY KCOF and its affiliate entities and Fizz, Inc. and its affiliate entities, and all of their respective officers, directors, employees, agents, representatives and assigns (collectively, the “Releasees”), from any and all liability of any and every kind arising on account of or in any way resulting from Injuries and/or Damages that I may incur or sustain in connection with the Hunt and/or my participation therein, including but not limited to any such liability, injury, damage and/or loss that is caused solely or in part by the fault (including but not limited to the negligence and/or gross negligence) of the Releasees or any of them, in any way connected with the Hunt. I further agree to HOLD HARMLESS the Releasees from and against the full amount of any claims, damages, injuries or losses caused by my own negligence while a participant on the Hunt. I understand and intend that this Liability and Photo Release and assumption of risk also are binding upon my heirs, executors, administrators and assigns, and includes any minors accompanying me on the Hunt. I have read this Liability and Photo Release in its entirety and I freely and voluntarily (i) sign this Liability and Photo Release and (ii) assume all risks of the Injuries and Damages and, notwithstanding such risks, I agree to participate in the Hunt. PHOTO RELEASE: I hereby authorize KCOF and/or other parties designated by KCOF (including but not limited to periodicals, other printed matter, electronic media, and their editors) to use my photograph and/or video for reproduction in any media at any time KCOF or its designees see(s) fit for the purposes of advertising, display, exhibition or editorial use. I HAVE READ THE ABOVE LIABILITY WAIVER AND PHOTO RELEASE IN ITS ENTIRETY AND HEREBY CONFIRM MY AGREEMENT WITH AND ACCEPTANCE OF ITS TERMS.